Do you know that dying flowers at home is so easy? The method does not require any expensive tools or skills at all! All you need to have: food coloring, vases, and white or light colored flowers. 1. Buy some white or light colored flowers. 2. 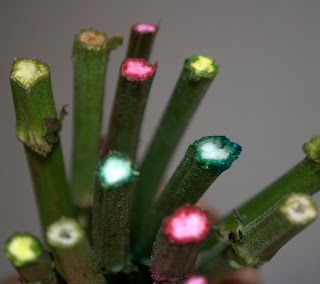 Cut the stems diagonally at the tips to ensure a fresh cut so water will be taken up easier. 3. Fill your vases or other container with water. 4. Add the desired amount of food coloring. 5. Place flowers into desired colored water. 6. Keep an eye on the flowers and remove once the desired color effect is reached. 7. Put flowers into fresh water vase and enjoy! Wow, I didn't know this trick. It is so great, I definitely have to try it. Thank you for sharing!